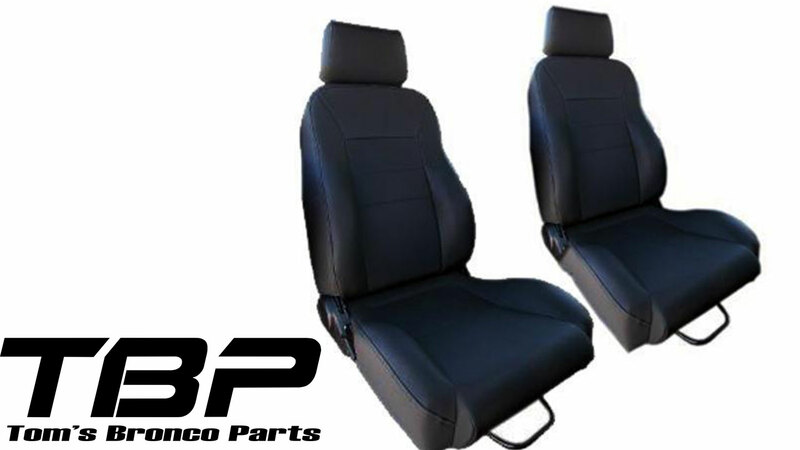 Custom Front Bucket Seats with Mounting Brackets for 66-77 Classic Ford Bronco. Black Denim-Weave Vinyl, very comfortable, adjustable head rest. Seats are made of high quality denim-weaved vinyl and come in Black, Gray or Spice. Both seats slide forward and backward, and both recline forward and backward with a lever. Kit includes custom mounting brackets and sliders. Mounting brackets bolt to the factory front seat mounting holes and require 2 holes to be drilled for the rear passenger seat mount. NOTE: Image is for illustration, color may vary some.